This interview took place on: 3/29/11. JFH (Roger Gelwicks): Dear Diary was definitely a concept record; what was the inspiration for My Brain Say Stop But My Heart Says Go!? Trevor McNevan: Yeah, this one's very much not a concept record. It's very intentionally a set of inspired songs. I think the process in making this record was very natural; the best way I can put it is it was very inspired. I wrote most of it while I was on tour with Thousand Foot Krutch last year. It's kinda about all those moments in our lives where we feel like we're supposed to do something but we kinda hold ourselves back because we think too much about it or we stop ourselves because of using too much logic or not wanting to take that step when you feel like you have to because you can't always feel the ground you can step on. So it's kinda about using childlike faith, you know? JFH (Roger): If you could sum up the new record in one word, what would it be? Trevor: That's a great question. I would say "polished." It feels a little more polished and intentionally a little more "Top 40" than our other stuff. It feels very complete to me. JFH (Roger): Going to specific songs, I felt like the theme of "Black Tattoo" was very similar to TFK's "Look Away"; would you agree with that? Trevor: Yeah! They share that same theme of an abusive relationship. I think "Black Tattoo" zeroes more in on the story of a particular female going through that relationship and being mistreated. "Look Away" is a little bit more the story of both a boy and a girl, two different stories. And it's more out of the point of view of each of those people. But they both have that same theme in a sense, yeah! JFH (Roger): Are you allowed to go into specifics on the story behind "Black Tattoo"? Trevor: It was something I made up, but to me, that's how those two songs are the same: they were very inspired by letters to the band about what people are going through - feeling like they didn't have anything in their life that they could share some of these things with. They felt kinda humiliated or like it was a dark secret they couldn't share with anyone. We feel very humbled and honored that they would feel like they could share that with us. These songs were big-time inspired by some of those emails and letters. JFH (Roger): What song means the most to you personally on this record? Trevor: I think the one that is closest to my heart is a song called "Lost In You." It's pretty much just an honest worship song. I've always felt like with TFK, and FM Static especially, that we're worshipping in our own way. It's not traditional Chris Tomlin-type stuff. But we're all Christians and our faith is who we are and we worship God the way that we do. I kinda look at it that way anyways. JFH (Roger): What's the story behind the car on the cover art? Trevor: Well, Ryan Clark from Demon Hunter is the head of the art department at Tooth & Nail, and he's a good buddy and I work back forth with him. With the album's theme, we were trying to think of a fun way to tie it in. 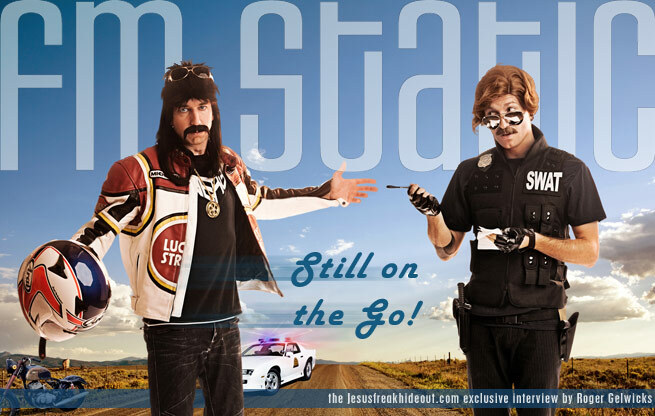 It started with a spoof photoshoot with Steve [Augustine]; I was dressed as a cop with FBI gear pulling him over for speeding. We thought it would be a funny take on the record's title. That's kinda how the cheesy muscle car theme flew into it. It was just this fun thing we ran with. JFH (Roger): Is it a real car? Trevor: It is a real car, but the license plate is not. Not my car. *laughs* Though that would be sick. JFH (Roger): FM Static has been around for over eight years. In hindsight, did you see this as a whole side project or was it originally a one-album kind of deal? Trevor: That's honestly exactly what it was. It started where I had written a bunch of songs that ended up being the first record. I had a lot of fun messing around with the "lighter side" of things that would never fit into the TFK pocket. That's kinda how that whole idea was birthed. We told it to Brandon [Ebel] from Tooth & Nail and he was stoked. And we were just like "why don't we just put it out as another band?" We did sign a record deal, but it was never supposed to be a long term deal. But we put the record out to have fun with it, and we didn't plan on it being anything. But it was so much fun, and it grew its own legs over the years, and we played a bunch of shows. We never forced a record with any urgency, like "we gotta get another one out by this date." It's always been a very inspired process, which keeps it fun in itself, and kept it unforced. JFH (Roger): Your personal career has lasted over a decade, and you've been with Tooth & Nail for most of it. How has the industry changed over that time? Trevor: It's changed a lot. We used to do everything ourselves as an indie band for about six or seven years, but we've seen everything come a long way in so many good ways. It's definitely taken a big hit, and many would agree, to still connect with music and get it to the people in the same way, because you have to sell something. It's really more on a record label front that they're really dealing with that stuff. It does affect us, but we focus on the music, and live shows, and connecting with people. That's what we love and do, and we're going to keep doing that either way. But yeah man, it's changed a lot. The tools that are out there now for new bands starting and the social media to promote them are great. We never used to have that stuff. We used to hand-mail CDs out to people and whatever. So I think new bands have it a lot easier in a lot of ways, but the population of new bands and music is so much greater than it used to be, because these new bands have their own home studio. You can make it now, and put it up later today, you know? There's a lot of competition, and a lot of bands battling the stealing of music. JFH (Roger): Yeah, I wanted to ask about that specifically, actually. Digital music is one of the biggest changes in the last 15 years, and there's a blog post discussion all about it on JFH. What's your take on battling music piracy? Trevor Right now, to combat them, we don't battle them with "no, you can't have it if you don't pay for it!" because people are going to get it for free whether we like it or not. We put the trust into the people who support us and the people who will still pay for music because they love it. A lot of times, you stream the entire record for free online for fans sometimes too. But you do your best and give people what they want to hear, and hopefully they'll buy it and share it. And at the end of the day, it's more about getting the record out to more people than to how many records you've sold. JFH (Roger): Switching to TFK here, besides the upcoming live record [Live at the Masquerade], when can we expect a follow-up to Welcome to the Masquerade? Trevor: Well right now, I'm literally in the studio writing for the new TFK record this month and next [March and April 2011]. So yeah, we're working on new music right now, and long story short, we've come to the end of our record deal with Tooth & Nail, so we're figuring out where that next home's gonna be for us, whether it's with Tooth & Nail, whom we love, or someone else. And basically our main focus right now is looking for new ways to get music to people sooner and more often. That's kinda what we'd like to do is find that connection and get it out sooner. So that's what we're working on, and the live record comes out June 7, and Tooth & Nail wanted to re-release Welcome to the Masquerade with three new songs. There's a cool pre-release contest we're doing where if you preorder the record at a discounted price, you get a free "Masquerade mask." So they will upload a picture of themselves wearing the mask and we're going to make a big collage poster, so it should be really cool! JFH (Roger): This actually isn't my question, it's Scott Fryberger's, but there's some rapping on this new FM Static project; have you considered doing your own hip hop side-project? Trevor: *laughs* I grew up all hip hop, and until I was sixteen, that was all I had listened to. TFK used to have a lot of fun with that, even before people like Limp Bizkit came along, and new TFK stuff is making its way towards that because it's something we love. So no, there isn't a side-project, there's too much to do, but I love hip hop and I always will. It's few and far between these days to find great hip hop that's not kinda cheesy, and I still love it. FM Static's new album My Brain Says Stop, But My Heart Says Go! is available now!